We have a special holiday treat for you this month: an interview with Heather Vogel Frederick, author of The Mother-Daughter Book Club series! In this episode, Michelle and I chat about her latest book, Home for the Holidays, which has the book club members reading one of my favorite series of all time: the Betsy-Tacy books, by Maud Hart Lovelace. Heather is absolutely lovely, and so are her books! But wait-- there's more! 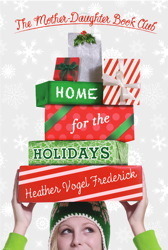 Heather is generously offering an AUTOGRAPHED copy of Home for the Holidays to one lucky winner. Just listen to this podcast episode and leave us a comment here on this blog entry. Tell us what you love about Heather's books, the Betsy-Tacy books, or share your favorite holiday tradition! And be sure to leave your email so we can be sure to contact you if you win. Deadline for entries is Saturday, December 17. This contest is open to US and Canada residents only. Would you like to download this podcast? Click here for the mp3. Or subscribe via iTunes! We also want to announce that this is the inaugural episode of a new feature on our podcast: KidLit Corner. Our primary focus on this podcast is YA lit and rockin' music, but we both love children's literature, too. Avid readers as kids, now with little readers of our own, we have a soft spot for KidLit. So we thought it would be fun to feature rock star children's authors on this podcast sometimes, in addition to fabulous authors for teens. KidLit Corner will be an occasional feature of the program, and we hope you'll enjoy it as much as we do! Thanks for listening-- please let us know what you think, and again, be sure to comment with some holiday cheer for the wonderful Heather Vogel Frederick and our featured musician, Debi Derryberry. Hosting courtesy of archive.org. Intro music by 46bliss. "Baby Banana" by Debi Derryberry is our featured song for this podcast. You can learn more about where to purchase Debi's CDs over on her website. "the Betsy-Tacy BOOK" ... sorry, that shouldn't have been plural! I love The Mother-Daughter Book Club, because Heather put's the characters in real situations, and solves them the way anyone would. It's so realistic, and I love it. It is like you're IN the book, as one of the characters. Let's see, I absolutely love the relationships between the best friends in the Mother-Daughter Book Club! My favorite Christmas tradition is writing on helium balloons on Christmas Eve and then sending them up in the sky! I love the mother daughter book so much because of the realisticness of the girls. I love how varied, yet relatable, the mother-daughter books are. I love how you can relate to the books, and you feel as if you are part of the story. I love the MOther Daughter Book Club because it lets me know that I'm NOT alone when it comes to drama and such- in a way so realistic to all of us readers(I think). I love how each character is different in their own ways, but they can all still be friends. These series always make me laugh, in a natural way, which is hard to find in a book! I am also like each girl (even Becca) someway or another. For example, I like sports- mostly volleyball, but I make touchdowns in football, too-(like Cassiday); I love fashion and want to be a fashion designer when I grow up, not to mention I have a sketchbook with all of my designs in it(well, of course you know who that is- Megan!! ); I love writing and also want to be a writer when I grow up, just as much as I want to be a fashion designer and teacher(like Emma- well, the writing part, anyway); and like Jess, I love animals and is pretty smart- except, I think that last bit about being smart would be like Emma, though I AM good at math. Hm... And lastly but not leastly(if such a word exists! ), I have the same name as Becca. Oh, yeah! I'm also Asian-American, like Megan. The Besty tacy books tend to feel real to me. These books are so funny and adventurous, and different from all the other books that the book club has read together. I love the idea of a book club!